For commemorative US stamps, 1940 was a huge year. The year started out with the introduction of what philatelists call the Famous Americans Issue. These thirty-five portrait commemorative stamps, separated into seven categories of five stamps each, first appeared at the end of January 1940 and continued through the end of October 1940. Other commemorative US stamps issued during 1940 included important events in the growth of the United States, as well as a special commemorative stamp issue for what was probably the single most important political event, since the ratification of the U.S. Constitution. With the eventual involvement of the United States in World War II on the horizon, the year ended with a propaganda-themed set of pictorial US stamps, intended to publicize national defense and to reinforce American patriotic feelings. 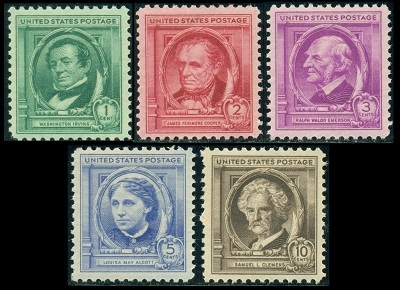 The five Famous Americans Issue US stamps shown above (Sc. #859-63) were issued between January 29 and February 13, 1940 to honor Famous American Authors. The 1 C. denomination features a portrait of Washington Irving (1783-1859), an American author, essayist, biographer, and historian. He is best known for his short stories, Rip Van Winkle and the Legend of Sleepy Hollow. The 2 C. denomination features a portrait of James Fenimore Cooper (1789-1851), an American writer of historical romances of frontier and Indian life in early America. He is best known for his novel, The Last of the Mohicans. The 3 C. denomination features a portrait of Ralph Waldo Emerson (1803-1882), an American essayist, lecturer, and poet, who led the Transcendentalist Movement during the 19th Century. The 5 C. denomination features a portrait of Louisa May Alcott (1832-1888), an American novelist, best known for her book, Little Women. The 10 C. denomination features a portrait of Samuel L. Clemens (1835-1910), best known by his pen-name, Mark Twain, an American novelist and humorist. He is considered one of the all time greatest American writers. William Faulkner (1897-1962) later referred to Mark Twain as the father of American literature. Having grown up in Missouri, many of his works focus on his early life along the Mississippi River. His pen-name is based on the term "mark twain", a measure of water depth used by Mississippi River boat crewmen, meaning "two fathoms" or about twelve feet. Two of his best known novels are The Adventures of Tom Sawyer and The Adventures of Huckleberry Finn. 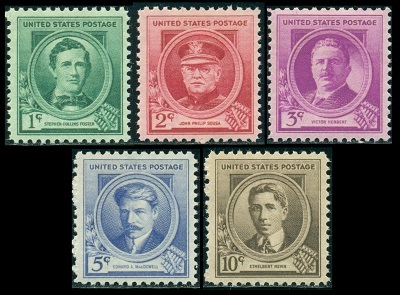 The five Famous Americans Issue US stamps shown above (Sc. #864-68) were issued between February 16 and February 24, 1940 to honor Famous American Poets. The 1 C. denomination features a portrait of Henry Wadsworth Longfellow (1807-1882), an American poet and educator. His famous works include Paul Revere's Ride, The Song of Hiawatha, and Evangeline. The 2 C. denomination features a portrait of John Greenleaf Whittier (1807-1892), a Quaker poet, editor, and an outspoken advocate for the abolition of slavery. The 3 C. denomination features a portrait of James Russell Lowell (1819-1891), an American Romantic poet, critic, editor, and diplomat. The 5 C. denomination features a portrait of Walt Whitman (1819-1892), an American poet, essayist, and journalist. His best known work is Leaves of Grass. The 10 C. denomination features a portrait of James Whitcomb Riley (1849-1916), an American writer and poet. He is best known for his children's poetry, of which the best known is The Elf Child, which eventually became the inspiration for the character Little Orphan Annie. 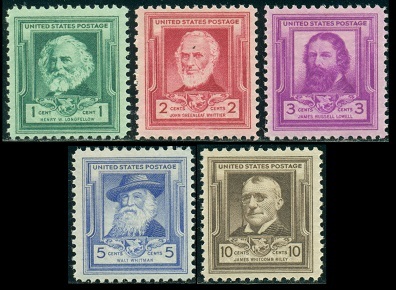 The five Famous Americans Issue US stamps shown above (Sc. #869-73) were issued between March 14 and April 7, 1940 to honor Famous American Educators. The 1 C. denomination features a portrait of Horace Mann (1796-1859), an American politician and educational reformer. He was an advocate for universal public education. The 2 C. denomination features a portrait of Mark Hopkins (1802-1887), an American educator and Congregationalist theologian. The 3 C. denomination features a portrait of Charles W. Eliot (1834-1926), an American academic who was selected as Harvard's president in 1869. He transformed the provincial college into the preeminent research university that it is today. The 5 C. denomination features a portrait of Frances E. Willard (1839-1989), an American educator, temperance reformer, and women's suffragist. Her influence was instrumental in the passage of the 18th and 19th Amendments to the U.S. Constitution. The 10 C. denomination features a portrait of Booker T. Washington (1856-1919), an African-American educator, author, orator, and advisor to Presidents Theodore Roosevelt and William Howard Taft. 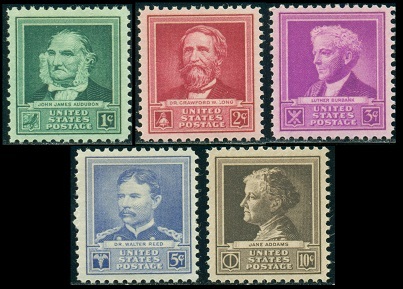 The five Famous Americans Issue US stamps shown above (Sc. #874-78) were issued between April 8 and April 26, 1940 to honor Famous American Scientists. The 1 C. denomination features a portrait of John James Audubon (1785-1851), an American ornithologist, naturalist, and painter. He is famous for his studies of American birds and for his detailed illustrations that depicted the birds in their natural habitats. The 2 C. denomination features a portrait of Dr. Crawford W. Long (1815-1878), an American surgeon and pharmacist, credited with the first use of inhaled ether, for use as an anesthetic before surgery. The 3 C. denomination features a portrait of Luther Burbank (1849-1926), an American botanist, horticulturist, and a pioneer in agricultural science. During his career, he developed more than 800 strains and varieties of plants. The 5 C. denomination features a portrait of Major Walter Reed (1851-1902), a U.S. Army physician that confirmed that malaria was transmitted by a particular species of mosquito, rather than by personal contact. The 10 C. denomination features a portrait of Jane Addams (1860-1935), a pioneer American settlement social worker, public philosopher, sociologist, author, and a leader in women's suffrage and World peace. Addams was one of the most prominent reformers of the Progressive Era, helping to focus America's attention to the needs of mothers, such as the needs of children and public health. In 1931, she became the first American woman to be awarded the Nobel Peace Prize. She is considered the founder of the modern vocation of social work. 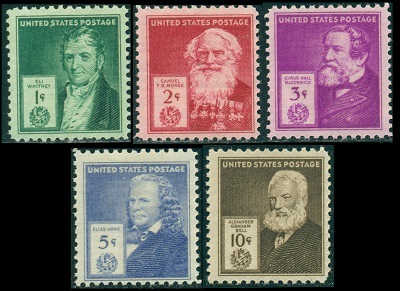 The five Famous Americans Issue US stamps shown above (Sc. #879-83) were issued between May 3 and May 13, 1940 to honor Famous American Composers. The 1 C. denomination features a portrait of Stephen Collins Foster (1826-1864), an American songwriter, widely known as the father of American music. Of the over 800 songs he wrote, some of the most famous are Oh! Susanna, Camptown Races, Old Folks at Home, My Old Kentucky Home, Jeanie with the Light Brown Hair, and Beautiful Dreamer. The 2 C. denomination features a portrait of John Philip Sousa (1854-1932), a composer and conductor of the Romantic Era, best known for his patriotic and military marches. Some of his most famous works are The Washington Post, Semper Fidelis, and The Stars and Stripes Forever. Sousa is also the inventor of the Sousaphone, a large, circular brass instrument similar to a Tuba, that can be easily carried in a marching band. The 3 C. denomination features a portrait of Victor Herbert (1859-1924), an Irish-born, German-raised, American composer, cellist, and conductor. He is best known for his many successful operettas, which premiered on Broadway between 1890 and 1917, one of which was Babes in Toyland. The 5 C. denomination features a portrait of Edward A. MacDowell (1860-1908), an American composer and pianist of the Romantic Era. He was one of the first Americans honored by membership to the American Academy of Arts and Letters. The 10 C. denomination features a portrait of Ethelbert Nevin (1862-1901), an American composer and pianist. His 1901 bedtime lullaby, Mighty Lak'a Rose, has become an all time hit, and it has been performed by many vocalists over the past century. The five Famous Americans Issue US stamps shown above (Sc. #884-88) were issued between September 5 and September 30, 1940 to honor Famous American Artists. The 1 C. denomination features a portrait of Gilbert Charles Stuart (1755-1828), considered to be one of America's foremost portraitists. Over his career, Gilbert Stuart produced portraits of over 1,000 people, including the first six Presidents of the United States. The 2 C. denomination features a portrait of James A. McNeill Whistler (1834-1903), an American artist, best remembered for his 1871 painting, Arrangement in Grey and Black No. 1, commonly referred to as Whistler's Mother. The 3 C. denomination features a portrait of Augustus Saint-Gaudens (1848-1907), an American sculptor of the Beaux-Arts generation, who embodied the ideals of the American Renaissance. He first achieved success through the sculpting of monuments and statues celebrating the heroes of the American Civil War. Augustus Saint-Gaudens was also a numismatist, and he designed the United States $10 and $20 gold coins minted between 1907 and 1933. 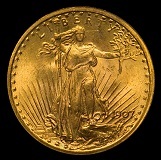 An image of the Saint-Gaudens Double Eagle ($20) gold coin of 1907 is shown above. The 5 C. denomination features a portrait of Daniel Chester French (1850-1931), one of the most acclaimed American sculptors of the late 19th and early 20th Centuries. He is best known for his monumental statue of Abraham Lincoln, in the Lincoln Memorial, Washington, D.C. The 10 C. denomination features a portrait of Frederic Remington (1861-1909), an American painter, illustrator, sculptor, and writer, specializing in depictions of the American Old West, particularly cowboys, American Indians, and the U.S. Calvary. 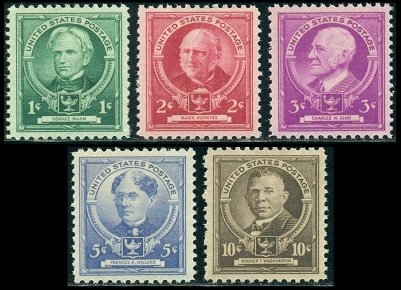 The five Famous Americans Issue US stamps shown above (Sc. #889-93) were issued between October 7 and October 28, 1940 to honor Famous American Inventors. The 1 C. denomination features a portrait of Eli Whitney (1765-1825), the inventor of the cotton gin. He was also an arms manufacturer, and he manufactured muskets for the U.S. Army until 1825. The 2 C. denomination features a portrait of Samuel F. B. Morse (1791-1872), an American painter and inventor. In his later years, he began working on the single-wire telegraph. He was the co-developer of the Morse Code and helped to develop the commercial use of the telegraph. The 3 C. denomination features a portrait of Cyrus Hall McCormick (1809-1884), a pioneer of the mechanical reaper and the founder of the McCormick Harvesting Machine Co., which became part of International Harvester Co. in 1902. The 5 C. denomination features a portrait of Elias Howe (1819-1867), a pioneer in the invention of the sewing machine. The 10 C. denomination features a portrait of Alexander Graham Bell (1847-1922), a Scottish-born American scientist, inventor, engineer, and innovator, credited with the invention of the telephone. 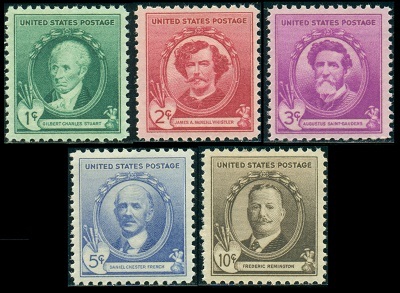 These five Famous American Inventors US stamps conclude the 1940 Famous Americans Series. Other similar US stamps would be issued in coming years to honor noteworthy Americans, but they are not considered part of this series. They will be reviewed in the pages for the particular years in which they were issued. Though the United States was at peace in late 1940, it was obvious to most everyone that the country would eventually be drawn into the conflicts in Europe and Asia that would become World War II. The three patriotically-themed US stamps shown above (Sc. #899-01) were issued on October 16, 1940 to publicize the need for a strong National Defense. The 1 C. denomination is inscribed INDUSTRY-AGRICULTURE, and it features the Statue of Liberty. The 2 C. denomination is inscribed ARMY AND NAVY, and it features a 90 mm. Anti-aircraft Gun. The 3 C. denomination is inscribed SECURITY-EDUCATION-CONSERVATION-HEALTH, and it features the Torch of Liberty. These three US stamps exist in horizontal pairs that are imperforate vertically (Sc. #899b, #900a-01a), and they are quite inexpensive. They also exist as gutter pairs, but those are a bit pricey. The 3 C. denomination stamp shown above (Sc. #894) was issued on April 3, 1940 to celebrate the 80th Anniversary of the Pony Express. The design of this stamp shows a Pony Express rider. The Pony Express, established in 1860, was a service for delivering messages, letters, small packages, and newspapers, between St. Joseph, Missouri and Sacramento, California, by horseback, utilizing a series of relay stations. During its 18 months in operation, it reduced the time for the delivery of mail, between the East Coast and the West Coast of the United States, to about 10 days. Once telegraph communications were established, spanning the United States, the costly Pony Express service was no longer needed. The 3 C. US stamp shown above (Sc. #895) was issued on April 14, 1940 to commemorate the 50th Anniversary of the Founding of the Pan-American Union. The design of the stamp features The Three Graces, a partial detail from the famous Renaissance painting, Primavera, by Sandro Botticelli (1445-1510). This design motif alludes to the inscription at the bottom of the stamp, which reads: "A Hemisphere of Good Neighbors / North, Central, and South America". The 3 C. denomination stamp shown above (Sc. #896) was issued on July 3, 1940 to celebrate the 50th Anniversary of Idaho Statehood. The design of this stamp features the Idaho State Capitol. The 3 C. denomination commemorative stamp shown above (Sc. #897) was issued on July 10, 1940 to celebrate the 50th Anniversary of Wyoming Statehood. The central design of the stamp features the Wyoming State Seal. The commemorative stamp shown above (Sc. #898) was issued on September 7, 1940 to celebrate the 400th Anniversary of the Coronado Expedition. The design of the stamp features the painting, Coronado and His Captains, by Gerald Cassidy (1869-1934). Francisco Vazquez de Coronado (1510-1554) was a Spanish conquistador and explorer who led an expedition from Mexico to present-day Kansas, through the modern-day Southwestern United States, between 1540 and 1542. Coronado had hoped to reach the mythical Seven Cities of Gold. His expedition succeeded in the discovery, by the first Europeans, of the Grand Canyon and the Colorado River. The 3 C. denomination US stamp shown above (Sc. #902) was issued on October 20, 1940 to commemorate the 75th Anniversary of the 13th Amendment to the U.S. Constitution, abolishing slavery. The stamp depicts the Emancipation Monument: Lincoln and a Kneeling Slave, by Thomas Ball (1819-1911). The memorial is located in Lincoln Park, Washington, D.C. The new amendment passed the Senate on April 8, 1864 and the House of Representatives on January 31, 1865. It was then sent to the states for ratification. On December 18, 1865, the amendment was ratified by the required majority of states, and it officially became part of the U.S. Constitution. The 13th Amendment abolished the institution of slavery, but Black Americans still held a very precarious position in American society, often being mistreated or discriminated against. Actual equality would not be guaranteed for another hundred years, after the enactment of the Civil Rights Act of 1964. The 3 C. denomination stamp shown above (Sc. #903) was issued on March 4, 1941 (the only stamp issued during 1941) to celebrate the 150th Anniversary of Vermont Statehood. The design features the State Capitol in Montpelier.